Went home for lunch today and worked on a portrait of Mickey Free's friend, the lad who spent time on the rock, then disappeared into the Sierra Madres. His end is a mystery and he has become a dark folk hero. Daily Whip Out: "The Apache Kid"
In Apache war culture, braves would take from those they vanquished a piece of jewelry, a ring, or a crucifix or ornament and wear it around their neck as good medicine. After many years in the Sierra Madre of Old Mexico, Kid accumulated quite a lot of mojo around his neck. 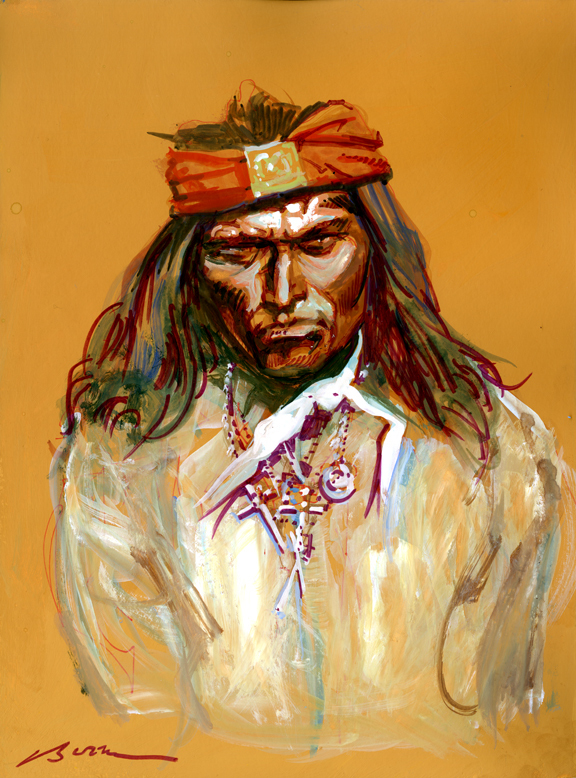 "Many of those I talk to here speak darkly of the Apache Kid. I even hear of the lingering fear among his living relatives that they might suffer repercussions for the crimes he committed. . .As frightened as people on the reservation were of the Kid, there is an undercurrent of admiration in the stories of my father and others have recorded about him. The Kid was a dark folk hero, a celebrated outlaw. He was at large in Mexico, living off the land, raiding when he felt like it. It was the old Apache way."